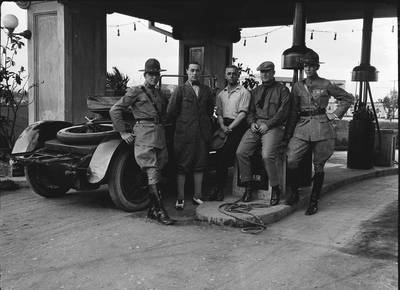 "Bernard Nedell and four other men, standing in front of an automobile"
Bernard Nedell [second from left with four other men, standing in front of an automobile. Still from the production of “The 13th Girl,” released in 1922 and featuring the Far East Players. Carl Louis Gregory was chief of production for the Orient and India Pictures Corporation, affiliated with the Frawley-Blood Motion Picture Company of New York.